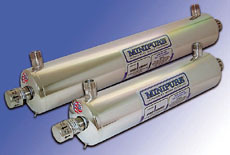 MINIPURE Ultraviolet Water Purifiers from Hauppauge, N.Y.-based Atlantic Ultraviolet Corp., are compact and economical. Units are available to treat flow rates from 1-to-9 gallons per minute. Hundreds of gallons are purified for each penny of operating cost. There’s no danger of overdosing, and no addition of dangerous chemicals. The effluent is guaranteed to exceed U.S. Public Health Standards for bacterial purity. Units are manufactured from stainless steel for dependable long life.